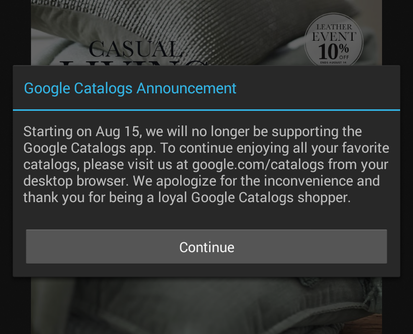 Google has decided to pull down the shutters on the mobile apps for its Catalogs service, but will continue to keep it running for US users on the Web. The service, which brings together digital versions of traditional catalogs stored all in one place for easy perusal and purchasing, will stop working on its iOS and Google Android apps on August 15, according to Android Police. It never made it beyond the US. While the service will live on online, and the apps are still available to download as of now, the closure of Catalogs suggests that just not that many people found shopping from catalogs on their tablets a very worthwhile use of time. It probably doesn’t help that virtually no one had heard of it either. The closure is also the latest to be issued from Google and follows the shuttering of its Google Reader service on July 1 this year. Google also plans to close its location tracking and sharing service Latitude on August 9, too.